Many locals and most tourists have never heard of these great places, just a short drive south of Puerto Vallarta. 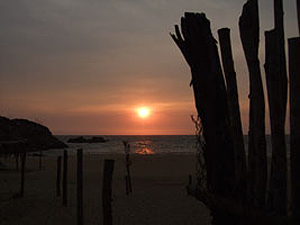 El Tuito, the most well known of the three, is only forty-five minutes on highway 200 from Vallarta. You drive through some very scenic country and a changing landscape along what is known as the palms to pines highway. Tuito is in the foothills of the Sierra Madre Mountains and at an elevation of around 3,000 ft. you will notice the cool mountain air and the scent of pine. You pass through forests of pine trees before coming down into beautiful rolling hill country. This is ranch country. It was not that long ago, when a horse was the preferred method of transportation, and certainly any cowboy is never without his saddle. 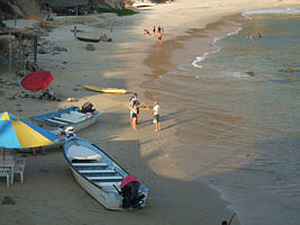 El Tuito is rich with history, it is the seat of the municipality of Cabo Corrientes, and has been since before the Spanish used it for the same purpose over 200 years ago. At the moment lodging is a problem in Tuito. So, overnight visits require some creative discovery around the area. There are however, eating establishments in and around the plaza area serving excellent food. A personal favorite is Mario’s patio restaurant by the municipal offices. El Tuito is a gateway, with roads heading off in a couple of different directions. One road will take you back in a northerly direction to Yelapa and places that were once only accessible by boat. The other road takes you in a southwest direction to the coast and the Mayto area. A drive of about forty-two kilometers on a road that is almost all surfaced and may be completed in a year or so. Travel time is about forty-five minutes to one hour at this writing. Just before you reach Mayto, there is a turn off that will take you along the upper coast to the road end at Corrales. For lodging and facilities you want to head to Mayto, Tehuamixtle, and Villa del Mar. You will find Hotel Mayto and Hotelito Rinconcito at Mayto beach. Two very different places. Mayto Hotel has a large pool, restaurant, and is on the beach. It attracts large groups at times and is popular with the ATV crowd. Other times it can be very peaceful. Rinconcito is back from the beach, no pool, rustic and a gathering place for locals. It does not have a restaurant, but they do cook a breakfast and dinner if you ask. Sometimes loud, as it is the place to party. They are also the place to camp, with beachfront spots and excellent facilities for campers. In Tehuamixtle you will find El Acantilado, a small casual hotel on the hillside. Simple clean rooms, a very small pool and no restaurant. A little farther down is El Cielito Cabanas. They offer charming clean cabanas, a great setting and pool overlooking the ocean, a restaurant, and services. Cielito attracts couples and those looking for a quite romantic experience. 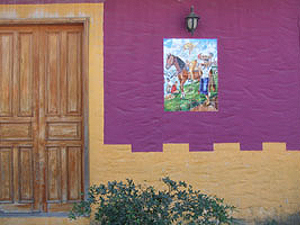 Area lodging prices range from $350 to $800 pesos per person a night. Some have specials or packages with meals. Prices change, so it is best to do some checking when planning a visit. No cell phone service in the area, but two hotels have Internet available.